To celebrate our newest Forum Sponsor Sierra Bullets coming on board we decided to have another forum contest. This one will be easy and anybody with a 20 caliber rifle shooting 39 grain sierra blitzking bullets will qualify to enter. The contest is simple, post up a picture of your best 5 shot group fired with the 39 grain Sierra Blitzking bullets and you are officially entered. This can be a new target that you shoot for this contest or a target that you have from the past. We are doing this on the honor system so please make sure that the target picture you submit was in fact shot with the 39 Sierra Blitzking bullets. The contest will be open today thru December 31st 2015. All the applicants that submit a photo will be entered into a drawing at the end of the contest, we will randomly pick one name out of a hat and award a 500 count box of the 39 grain Sierra Blitzking bullets. wow i am kinda surprised nobody jumped on this yet. For anyone that isn't aware a 500 count box of 39 Grain Sierra Blitzking bullets sells for $110 last i checked. Bill K emailed this pic to me and asked that i post it up for him. Bill stated in his email: "Five shot, Savage with X-caliber barrel. 3 groove 1/11 twist, in 204 Ruger. .462, 100 yards.. Sierra BlitzKing 39 Grain. At least I will be in for the drawing, I believe anyway. Thank You. Bill K ( These are one inch dots, that I use) ( By the way their 32 grainers work just as well ) But do like the heavier one’s for the coyote’s." CRT wrote: wow i am kinda surprised nobody jumped on this yet. For anyone that isn't aware a 500 count box of 39 Grain Sierra Blitzking bullets sells for $110 last i checked. I want to say a special "THANK YOU" to Sierra Bullets for becoming a sponsor of this Board and for the Small Caliber Club Board for putting on this contest. Here's my entry. The target below was shot at 100 yards off the tailgate of my pickup. I used my Harris 9-13" swivel bipod with notched legs for the front rest and a rabbit-ear sandbag for the rear rest. The rifle is built on a Savage Target action right bolt/left port in .204 Ruger caliber with a 26" stainless steel Lilja 1 in 12 twist three-groove #6 contour barrel. The stock I used is an H-S Precision Pro-Series 2000. There is a factory refurbished Nikon Monarch 6-24x50mm side focus scope on this rifle, sitting in Burris Signature Zee rings of medium height fastened to an EGW Picatinny scope rail. The barrel is fluted and I had Sharp Shooter Supply time and true the action. I have the barrel threaded for my GEMTECH TREK-Ti suppressor. I'm using neck turned Nosler brass and my 39 gr. Sierra BlitzKing bullets are coated with hBN. The load I'm using is 27.2 gr. of IMR 8208 XBR fired up by Remington 7½ primers. The bullets are seated .004" off the lands. Here is a photo of the rifle in action last Friday. While this group is not as good as the ones already posted, it does serve to enter me in the contest. This group at 100yds. (bottom left) is the FIRST five shots that I shot in the new 20 Nitro when we started the load development. Not contest related but this is my 6.5 ( 7mm SAUM necked down to 6.5...1000 yard gun) which has a 200 yard zero....this group shot at 100 yards (above circle). About 1 MOA high at 100 yards. Just shows what you can learn and the high value of friendships!!! I shot this target set yesterday with my 204R. The gun is one I put together a couple of years ago for PD's. It's a Savage model 11 action, CBI 26 inch varmint contour 1-11 twist chambered with their 204R Match reamer (short throat). Rifle Basix SAV-1 trigger set at 8 oz. 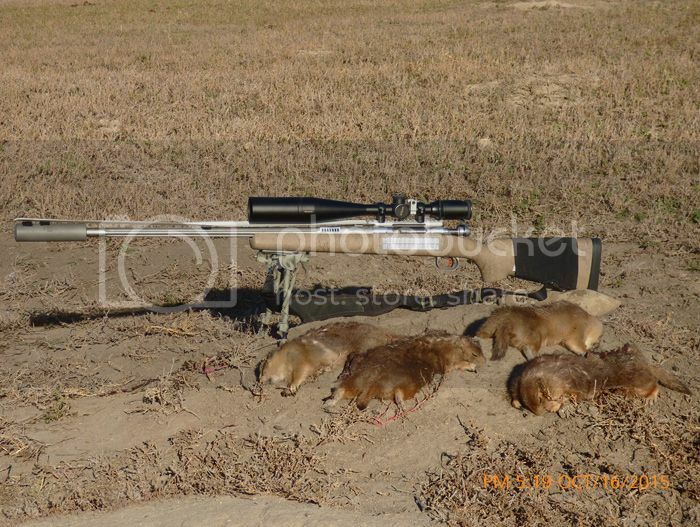 Boyds Pro Varmint stock with action and pillars Devcon bedded. Scope is a Nikon 6X18 Buckmaster. The load I had previously worked up for PD carnage is; R-P brass, Sierra 39 BK seated -.005 from touch, CCI 450 primers, 29.3 gr. of CFE 223 going 3930 fps. Conditions were windy so I thew in the flags to work on my wind reading skills. The wind was gusting/blowing 5 to 15+ and switching from 3:00 to 5:00. As you can see there were no wall hanger groups shot but a good day of shooting none the less. 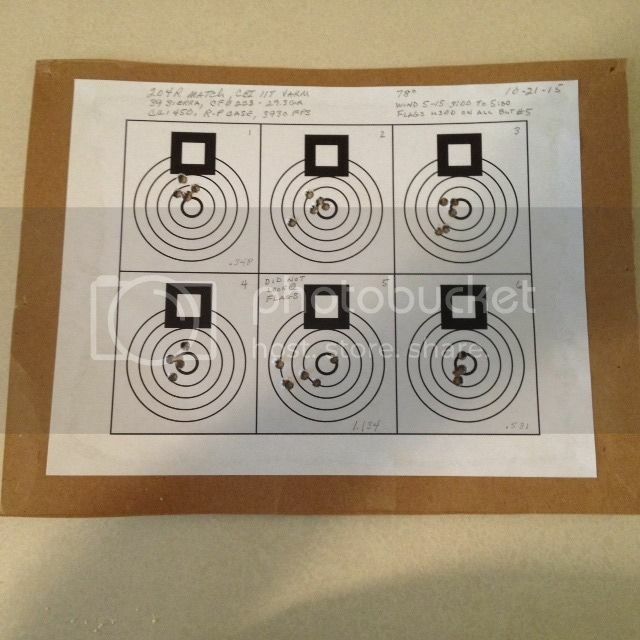 Note target #5 where chose to not pay attention to the flags and shot the group as if it was a calm steady condition. Great to have Sierra bullets as a new forum sponsor!! For my current two twenty cal rifles, there is no other bullet that consistently shoots tiny bug-hole groups as well as the 39gr Blitzking! ...love 'em! ... if I am testing other loads and things are not going well, I know that I can fire off a group of these 39gr SBK loads and instantly establish if it is the loads I am testing or just me having an off day. 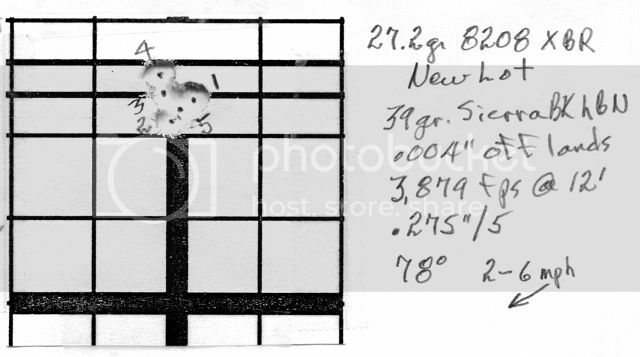 I have many small groups shot with both my Savage 20 Practical AI (Green Mtn barrel) and 20 Vartarg (X-caliber barrel), but can only seem to find pictures of a few three-shot groups. So, if these groups don't count, and I have to go shoot some more 5-shot groups... oh well, there are worse things that could happen! Thanks for putting on the contest CRT!